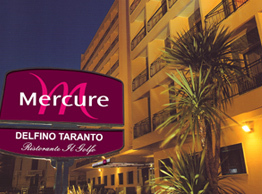 Point of diamond of the offer of Grand Hotel Delfino is its Center of Congress, that for rooms, equipments and experience is surely the more important of Taranto. Endowed with 8 rooms, with number of places that varies from 10 to 350 and with all the last congressional technological infrastructures, the Center of Congresses Grand Hotel Delfino, is really ideal for every kind of meeting. Inside of it, it has an exhibiting area of 300 mqs.